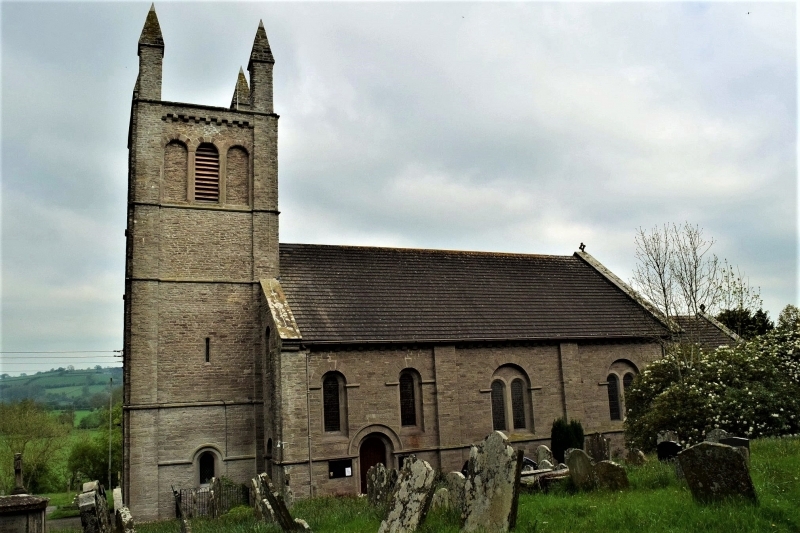 Location: Located on elevated ground parallel to the main Hay-on-Wye to Brecon road, the churchyard originally bounded on the SE side by the railway. Glasbury is connected in legend with St Cynidr, AD433-464 who is said to have founded a church here, and was buried in the parish. The original church for Glasbury in Brecknockshire was located on the floodplain of the river Wye, due W of the present site. The building appears to have been seriously undermined by the river during the Commonwealth period, and a new building was built on the present site and dedicated in 1665. This is turn fell into poor order, and in the early C19 was replaced by the new church. The present building was erected in 1837-8 at the cost of £3,000, the architect being Lewis Vulliamy, the chancel being added to the original simple box at the cost of £779 in a re-ordering of 1881-2, and the organ chamber was added in 1910, when a further re-ordering removed the gallery and 3-deck pulpit, to be replaced by the present furnishings. The Revd Francis Kilvert, the diarist, hoped to obtain the living of St Peter in 1871, and on his failure, took a curacy in Wiltshire. Grey sandstone ashlar with pecked dressings and C20 interlocking tile roof between raised gables. It comprises a 3-bay nave, a 2-bay chancel and a W tower of 4 stages. The vestry-organ chamber is added at right angles on the N side of the chancel. The building is in plain Norman revival style, the bays being defined by pilaster buttresses carrying a corbel table. Boarded door under a round arch springing from a mid-wall string. Two-light round-headed windows and a simple chamfered hood. The W door under the tower is of 2 orders of nook shafts and cushion capitals. At the E end, 3 wide-spaced lancets and a large oculus lights the E end of the nave above the lower chancel roof. The tower has a bell stage of 3 equal recessed arches, the centre one louvred. Large square pinnacles with pyramidal tops rise at each corner above the straight parapet, giving the building its distinctive appearance. Wide nave of 6 bays, the walls unplastered. Open rafter roof carried on tie beam trusses bracketed from wall corbels. Collar and queen post roof with an arch between the spandrels filled with light geometric timberwork. Wide round-headed chancel arch, and a tall arch to the vestry in the same plane. The chancel is of 3 roof bays, the trusses of hammer beams on brackets supporting and arch to the collar, the sides tied with an iron rod. The sanctuary is raised and tiled. Fittings: Pulpit a part octagon on a stone base, with brass handrail. Lectern also of brass. Openwork iron chancel screen, added 1881, with central arch and a canopy supporting a cross, various elements gilded. Organ by Norman and Beard, 1910, set in the inner part of the vestry. Sanctuary rail has turned balusters. The reredos behind the altar has a Crucifixion against a background of gold mosaic, by Powell of Blackfriars. Late C19 tapestry hangings to either side. Font: Octagonal, inscribed W/SHE/1635, with crudely carved roundels and birds on the tapering stem, found in a farmhouse in 1844 and brought in, is assumed to be from the original chapel at Aberllynfi, and the C19 font made to a similar shape, - a less inspired copy. Glass: Stained glass: E window - Resurrection scenes. N chancel window, Good Shepherd 1884. Nave S side windows of 1926, 1891 and two of 1900. W end the woman of Samaria, of 1890 with the monogram of glassmaker Edward Frampton (1846-1929). In the nave oculus a God in Majesty. On N side, similar glass, including memorial window of 1933 to Col Thomas Wood of Gwernyfed - a Christ with fishermen, by Comper? (Haslam). Monuments: In the chancel, 23 wall tablets in white and grey marbles, including Edward Allen of the Lodge and family, late C18-early C19, Walbeoff of Penllan, commander RN, Marianne Devereux of Tregoyd, 1768 - an urn against a grey marble pyramid set on a corniced panel, oval arms below. Devereaux and Cornewall-Devereaux family, Viscounts Hereford, monument by Hartley of Westminster, and monuments to the 13th, 14th 15th 16th and 17th Viscounts, by L.E.Thomas of London, the London Marble Works and others. Gothic marble aedicule to Walter Wilkins de Winton of Maesllwch Castle, MP, †1840. In the nave, 4 monuments on the N side to the Williams family of Trebinshun, including James Williams, 1815, a pilastered white marble panel with draped urn over. Also a brass to Walter de Winton of Maesllwch Castle and one to Samuel Alford, curate, and friend of Francis Kilvert the diarist. Included as an interesting essay in Norman revival by this eclectic architect, located in a prominent position. A graveyard monument located approximately 30m E of the east end of the chancel of the church. Located in the churchyard on rising ground, approximately 40m SE of the E end of the chancel of the church. Located at the E end of the churchyard, on the N side of the gate, built across the slope of the ground, with a small yard at the N end. The house is located on the right bank of the River Wye, at right angles and close to the main Brecon to Hay road. Located close to and on a bend of the River Wye, set apart from the village, at the far S end at the end of the road. The barn is located immediately NE of the Old Vicarage, with a forecourt to the end of the lane, all within the bend of the River Wye. Located at the SW corner of the Green, behind a front stone and brick wall.